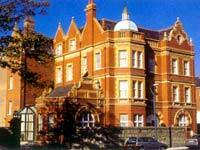 Located in a beautiful red brick Victorian building is the Hibernian Hotel. Original oil paintings, painted murals and antiques decorate the hotel. A previous winner of the yearly world-wide 'Small Luxury Hotels of the World' award, this hotel is the perfect base to discover Dublin city. The 40 bedrooms at the Hibernian are elegant and luxurious and feature double or two twin beds and all have en-suite facilities. Each of the spacious rooms are individually decorated and every care has been taken to make you forget you are sleeping in a hotel at all. Honeymooners would be hard-pressed to find a more romantic location in Dublin city. The Patrick Kavanagh Room is an award-winning restaurant and is famous for it's delicious cuisine prepared with only the freshest Irish ingredients. Guests can relax in the sun lounge, library and drawing room, all furnished with oil paintings, antiques and fresh flowers. Moments away from the American Embassy, it is a 10 minute walk from the RDS (host to many concerts and events). It is also right beside Baggot Street, a popular location filled with restaurants and pubs. Found on a quiet, leafy road, the Hibernian Hotel is close enough to all Dublin's attractions while avoiding the hustle and bustle of the city.